Would you like to know the secret for perfect pancakes? Then visit this great hospitable place which happens to be Almere’s best pancake restaurant. Dubbel-Op makes their legendary pancakes since 1993 already! The pancake house is located in the main building of the city estate De Kemphaan at Almere. It has more than 300 places, of which 155 inside and 150 outside at the covered terrace. The panorama restaurant has about 45 seats from where you have a great view on the ape islands of the AAP foundation. And this foundation is very important for the restaurant Dubbel-Op: The menu lists delicious sandwiches called Broodje AAP. For each of these sold sandwiches, a small donation of €0,10 goes to the AAP foundation. The broodje AAP are bio-sandwiches named after various ape species. And meanwhile more than €1.000,00 were collected in donations, just by selling them! 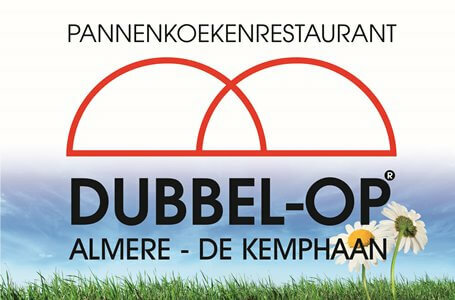 Dubbel-Op is not only the best pancake house of Almere. 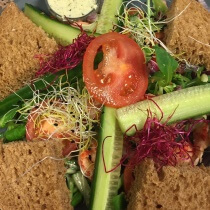 The restaurant has won many prices already, among which also the Flev(f)orel which was voted best local meal of the Flevoland province in 2011. Together with the Apple de Luxe pancake it even got a place of honour in the cooking book “Taste Flevoland”. 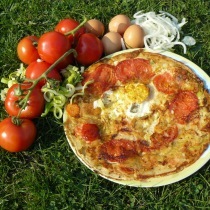 The FlevolandsBluf, a pancake variant with bacon, eggs and ham-cheese ragout, in 2004 won the prize for culinary inventiveness in Flevoland. And the natural pancake variant made it to the top in 2007, chosen as best pancake by the Dutch Consumentenbond then. Come over and taste all of them, here at De Kemphaan! Of course there is much more to do than just enjoying delicious pancakes at the Dubbel-Op. 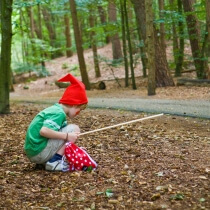 Go together with the kids into the forest, searching for dwarfs while following the ‘dwarf path’. Would your kid rather like to become an auxiliary ranger? Or go on a sheep / ape safari? Make an exploration tour together with your kids. Stroll through the premises of the estate and discover the flora and fauna of the Almeerderhout. The costs for either a dwarf or auxiliary ranger arrangement are €5.00 per kid. The sheep / ape safari costs €9.50 per kid. Apart from the arrangements for kids, also business meeting rooms are available for rent. From there you have a great view to the ape islands. During the summer season, Dubbel-Op organises various pancake parties where singers like Dirk Scheele, Hakim, Dikkie Dik and Tom Meijer will perform. Let your kids dance to their songs and eat wonderful pancakes before and after the dances! The events take place on the roofed theatre area of the city estate De Kemphaan. Singer Dirk Scheele even composed a special pancake song for the house: ‘Pannenkoekparty’, pancake party. Each time it is a great party indeed. So keep an eye on our event calendar! Don't want to eat pancakes? Of course there are fine alternatives. The same restaurant also offers Douwe Egberts high quality coffee, a High Tea, a farmer coffee table, sandwich buffets, aperitif with snacks, fondue and barbecue arrangements. As you can see, abundance of choice for everyone. No time for an extensive dinner? In that case, our take away service is a good option. At Dubbel-Op we highly value nature and health. Reason why our restaurant strives to offer, wherever possible, locally grown and produced organic food. All of our recipes are based on that principle. For example, the multi-grain flour is delivered by the grain mill “De Maagd” from Hulshorst. The plates are made of paper and 100% biodegradable. That also saves a *lot* of dish washing. The meat for hamburgers and barbecue comes directly from the city farm. And all that is good for the environment. The restaurant owners think it is important that, besides providing great food, some extra thought is given to society as a whole. Reason why they did several things: They designed a cobblestone as a symbol against violence, they adopted 9 seals, they surprised the local soup kitchen around St. Nicolas’ Day and they contributed much more to civil society work still. They would love to continue their contributions for many years to come.